Forgive me runners, for I have sinned. It’s been three weeks since my last real run, a five-miler with Steve and a dear runner-friend in California on March 24. I managed one easy downhill jog on our last full day in Hawaii on April 8 (it was so short, we didn’t even time it) and one 30-minute slog around Travis Air Force Base while waiting for a flight back to D.C. on Wednesday night. All told, I went two and a half weeks without running. I would like to blame it all on the fact that an early-trip, post-beach-day hike led to the most insane blood blisters I’ve ever experienced on both feet, making running prohibitively painful (public health announcement: be really, really certain you’ve wiped all the sand off your feet before lacing up your hiking boots). But the truth is, I’ve been worshipping other gods, those of cross-training. I did not let the blisters prevent me from donning hiking boots again to journey through a volcanic crater in Hawaii’s Volcanoes National Park, or along the unpopulated tip of the North Shore of Oahu, or to the remote green-sand beach at the southernmost point of the United States, or on a number of other incredible hikes we did. As you can see, I wasn’t exactly laying around—just not running. 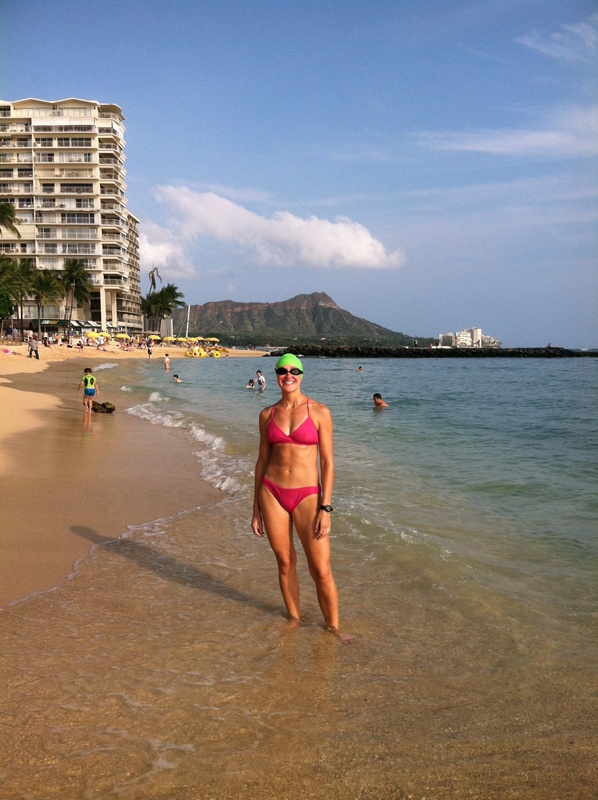 I swam, unafraid to be the only cap-and-goggle-wearing geek at posh, tourist-filled Waikiki (and believe me: I was definitely the only cap-and-goggle-wearing geek at Waikiki). I paddled, skipping a potential blister-free run day early in the trip trying to keep up with a canoe full of Marines who invited us along on their Polynesian-style paddling journey around Kaneohe Bay. I surfed, catching a few waves in the shadow of Diamond Head. And I spent a lot of time staring at the water, letting the 25-foot waves on Oahu’s North Shore and the gentle swells on the island’s leeward side lull me into a deep, meditative state. 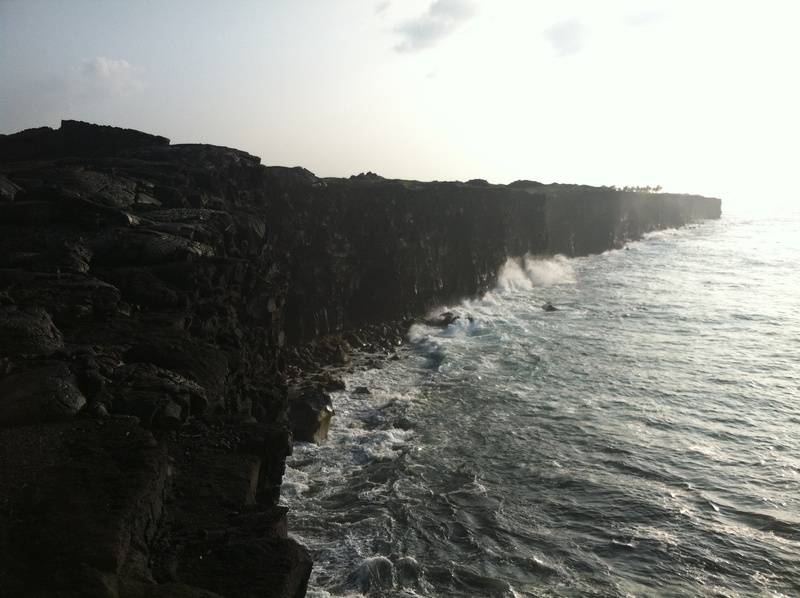 I could spend the rest of my life watching waves pound against volcanic rock on the Big Island, shown below. Was I subconsciously trying to sabotage my training for the New Jersey Half Marathon on May 5, which I’ve been cramming for thanks to my broken-elbow-rehab hiatus in February? Maybe. I still haven’t given up on the idea of the race, and think I’ll at least commit to running it until the 6.5-mile point, the relay changeup point (does it still count as a relay leg if I don’t pass the baton to anybody else?). Or maybe I was subconsciously trying to boost my elbow rehab. All that stand-up paddleboarding and swimming had a completely amazing effect on my elbow—though it felt incredibly sore and swollen immediately after each workout, I woke up each day with more strength and mobility. As of today, my last post-op doctor appointment, I’m happy to say that my mobility is back to 100 percent, with my strength not far behind. Or maybe I was just giving my heart what it needed: A period of calm to rebound from the pain and chaos of the past few months (or past few years, for that matter). In that sense, the trip was a big, beautiful success. If you have the chance to go to Hawaii, go. Before this trip, I understood its Technicolor beauty and aloha spirit only in the most cartoonish form. Now that I know how gorgeous and rugged the islands are, and how kind and loving its residents are, and how amazingly delicious the pineapple, coffee, chocolate and fresh fish are, I’m amazed I found the willpower to actually get on a plane to head home. But here I am. I’m ready to get back to regular showers (did I mention that we camped on the beach for large parts of the trip?) and working at desks rather than C-17s (did I mention that we took advantage of the military’s Space-A flights to get there and back?). I’m ready to start again. Yes, you gave your heart what you needed. There are all kinds of rehabilitation work–physical, emotional, and spiritual. We need all of them. you look fabulous and you sound happy, at peace. I’m a big fan of giving your heart what it needs. a “big beautiful success” When you call time spent that term, it has indeed been worthy of smiling contemplation later. I’m insanely jealous of your trip, it sounds beautiful! I finally went SUP in Florida this Feb and now I’m completely obsessed. I’m glad you had such a nice trip, you deserve it! Scott Jurek takes a month or two off every year … sometimes you really need that. PS That pink bikini (and your abs) look fantastic!! Whatever you’ve been doing, you look great! You look good girl! Jealous of the HI vacation. Surfing and SUP-ing, totally count as workouts! I just found your blog and would love it if you would share some info about how you found camping in O’ahu. My family of 6 is planning to spend July and August camping in O’ahu and we are feeling some trepidation after reading about unwelcoming locals, crime and even violence. Did you experience any of that? Will you share where you stayed? We are working on a shoe-string budget, also fly for free and have done several months long camping trips in other parts of the US with mixed results. (Northern California, for example, is amazing for this. Puerto Rico was not.) Thanks so much. Absolutely! We received the same warnings, so we chose our campsites carefully. Some were on military bases (if this is an option for you, stay at Bellows, http://www.bellowsafs.com—stunningly beautiful!). 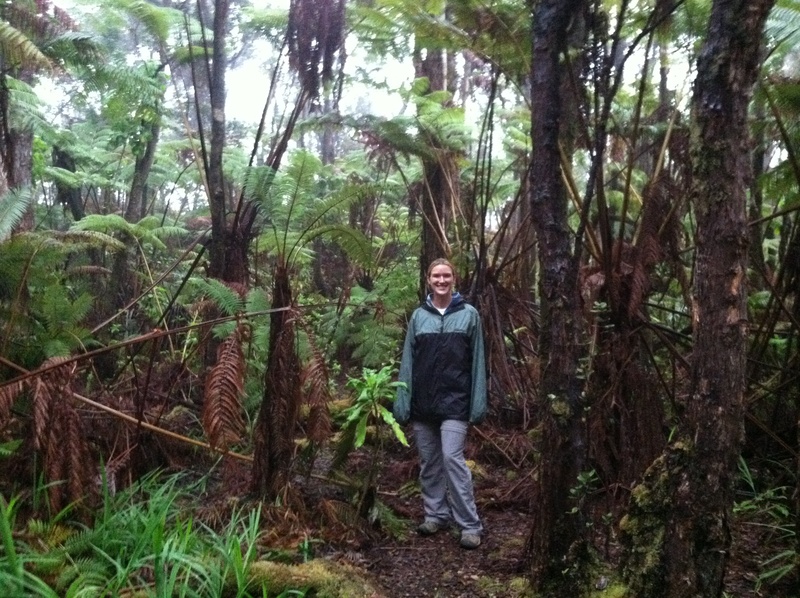 The one civilian campsite where we stayed was Malekahana on the North Shore. It was beautiful and clean, and we felt extremely safe. You can rent campsites through the state (www.hawaiistateparks.org/parks/oahu/malaekahana.cfm), or through Friends of Malekahana (www.malaekahana.net). Hope this helps some! Thanks! Still mulling the options of a cheap unfurnished apt (inside camping!) and packing up tents and moving camp twice every week. Glad you felt safe. Give me some hope.